I never knew when I started poring my simple musings into my Mac that it would mean strangers coming up and shaking my hand. Well that's exactly what happened this weekend. We had popped into town for summer sandals. This is a tricky job at the best of times. Anyway, it was definitely a 2 man job and it took all our patience and might, some jelly sweets and the promise of a playing of Mary Poppins to deal with it with a jolly smile on our faces. With 2 pairs of identical sandals purchased from shops at opposite ends of town in the bag, it was time for sustenance. We stopped and flopped in a hearty healthfood cafe and ordered jacket spuds and tea to boost our spirits. The girls asked if they could sit alone. What a super idea we thought. They could feel independent and grown up sitting at a table right next to us. As it happened the plan worked beautifully. They played with a few toys provided. 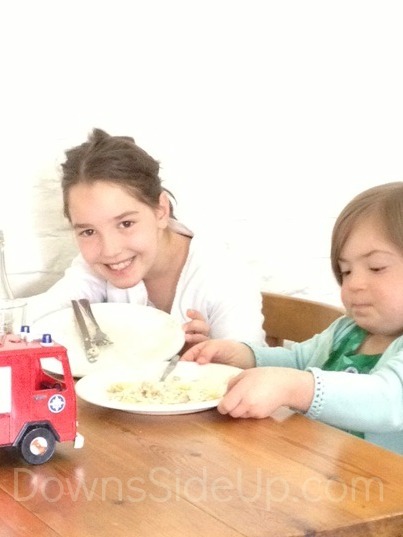 Natty sat still, didn't get down from the table once and ate her simple lunch which Mia had cut up for her and they chatted together easily without interruptions from the parents. They felt very proud of themselves. I noticed people looking. Perhaps they thought we were bad parents for banishing our children like this? Not wanting to sit together. As we got up to leave a lady and her mother came over. They just had to tell us what beautifully behaved children we had and how touched they were by their closeness, how amazed they were by Mia's gentle helping way with her younger sister. They left by saying we must be very good parents. Then, as we paid and donned our coats, the shoe shopping stress a distant uncomfortable memory, the chef of the establishment came out from the kitchen with his wife. This was a couple of a certain age, who clearly work all the hours they can to run a successful eatery. I didn't have them down as blog readers. The man leant forward and shook our hands. "I follow you on Twitter" he said. "What you do is amazing. I can tell it takes a lot of time." "What you do for others as a family is brilliant." And there you have it. You never know who is reading your words and the effect it is having on them when you blog your heart out. Did this couple have any connection to Down's Syndrome? They didn't mention it if they did. And that has always been my aim. To gently change perceptions of the condition from within hearts, without people even realising that I am doing it. Not preaching to the converted, but drawing in those who are not. I've often wondered what I'd do if I saw you walking down the street. Now I know I'd come over, gently clear my throat perhaps, and say hello! Then see if there was time for a coffee perhaps while our girls (who are about the same ages) played. Because we're changed as people and as parents by the slimmest connections and slightest interactions. So perhaps our next Cornish holiday? Or if you visit London? As always Hayley, another beautiful blog. It's fabulous, those moments, when complete strangers comment on your children's behaviour (because they have noticed how good they are, and not because one of them has Down's). How your heart warms because others recognise the inner qualities of our children rather than making preconceived judgements. As you rightly say gently changing perceptions - you are doing a wonderful job. I wonder if those who make these "little" comments realise what a difference they make to not just our day but our whole outlook? Yes, that's just it isn't it Yasmin. The comment was so heart warming, because yes, the girls are hard work and we have invested a lot of time in teaching them the right way to be, and secondly because DS was not on their lips although they may have thought it. That positive input makes it all worth while doesn't it. How fabulous, I love it. Different subject matter but that is exactly what I aim to do as well and I love the way you put it 'not preaching to the converted but drawing in close those who are not'.